Teddy bear collectibles need not just be confined to the soft toy. In fact many collectors also like to diversify their collection with other bear related items. Although teddy Bears have only been with us since the early 1900's, items depicting bears on them have been with us for much longer. So finding early memorabilia showing a bear is not hard to find, although their price may be prohibitive. But don’t worry, if you are thinking of starting your own teddy bear collection then there are still many bear related items still being made today and come at a much more reasonable price. 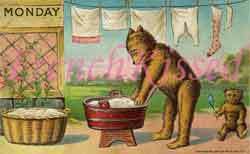 Dancing bears were very popular during the 19th century and as such many items were made showing realistic bears dancing. The bears often look very fierce and are also shown attached to chains. 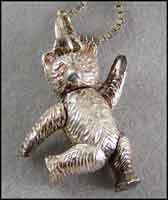 Bear images from this period are often found on pieces of china, silver drinking vessels and pottery. 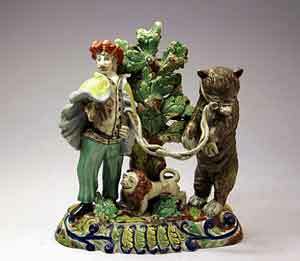 Later wooden bear figures became popular to decorate items such as brushes, bells and inkwells. 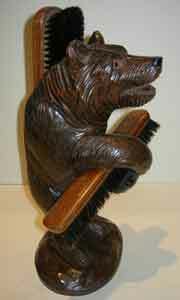 This wooden carvings are known as Black forest bears and can be very collectible in their own right. They can vary in price from a few pounds to a few hundred depending on size and intricate carving. As the craze for teddy bears took off during the early part of the 20th century many items were produced to look more like the cuddly teddies for babies. Items such as teething rings, rattles and play tea sets were produced in large quantities and many can still be found at boot fairs and antique shops. Of course collecting teddy bear memorabilia need not be restricted to antique and vintage items. There are still many items produced today that depict teddy bears and depending on the area that you decide to collect can be considerably low in price. A growing collector's trend is for teddy bear figurines. Many are made in resin and are relatively cheap to buy however there are some which are made in limited editions too which can command a higher price and so be more desirable to the collector too. Ceramic figurines generally are more expensive and tend to be made in smaller numbers and are also often made by artist's which again makes them more a teddy bear collectible. Tatty bear figurines by the Carte Blanche Company have become increasingly popular over the years and are relatively easy to find and of low cost. The "Cherished teddies Collection" by Hamilton Gifts are also highly sort after, as are "Colour Box miniature teddy Bears" made by peter and Frances Fagan. Christmas tree teddy ornaments are another area for collecting. 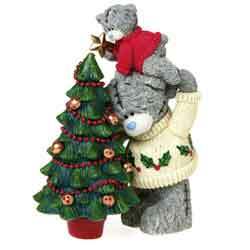 You'd be surprised just how many different teddy Xmas tree ornaments there are out there. To be honest there is probably not many items that have not at one time or another had a teddy bear depicted on it. I even remember teddy bear shaped soap when I was a kid in the 1970's and to someone a bar of that would add nicely to their teddy bear collection. Whatever you decide to collect you can be sure of one thing that your collection will be unique.